不知道系列會寫多長, 也許到終於被禁止 crawling data 為止 ? 系列命名採自 Korea MBC Battle.net Attack -- 其實沒什麼意義, 純粹好玩又想不到要取甚麼. 至資料蒐集日為止, OpenFoundry 上共有 1219 個專案, 但是專案編號事實上是從 1 ~ 1470, 換句話說其中有些專案已經因為某些原因被移除了 ( Deactivated ), 被移除的專案共有 241 個左右, 例如編號 14 的專案. 把這 1201 個專案依照其 Creation Date ( 以 Month 為單位作收納 ) 來整理, 可以得到下面的分佈長條圖. 很自然地會注意到幾個特別的分佈. 由於 Blogger 的顯示限制, 點選上圖可以看到比較清楚的 X 軸年月份標籤. 其中在 2004 ~ 2006, 以 4 ~ 6 月為中心的 Project Creation 數目明顯比周圍的月份來的高, 2007 年整年相對普通, 而 2008 及 2009 年則是變成 9 ~ 10 月份有相對高檔, 特別是 2008 年 10 月份一舉超過單月 70 個新開設計畫. 基本上一年之中 1 ~ 3 月新計畫的開設量少是可以理解的, 因為剛過完新年, 接近農曆年, 然後馬上又是四月初的春假, 這三個月正好是減溫到加溫中. 不過其他月份在 2008 以及 2009 年的反差實在有點大就是了. 話說這兩年的 10 月究竟有甚麼特別的呢 ? 本來還想做一張 Creation Date 對上 Last File Update 的時間關係, 不過做到一半驚覺 OpenFoundry 有未來檔案的問題. 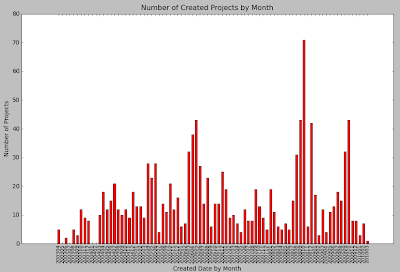 例如 Simple PHP Blog 正體中文與補強計畫 的最新檔案日期是 2019-11-17, 另外也有 2030 年的, 這樣讓時間可靠性產生很大的問題, 所以還是摸摸鼻子算了. 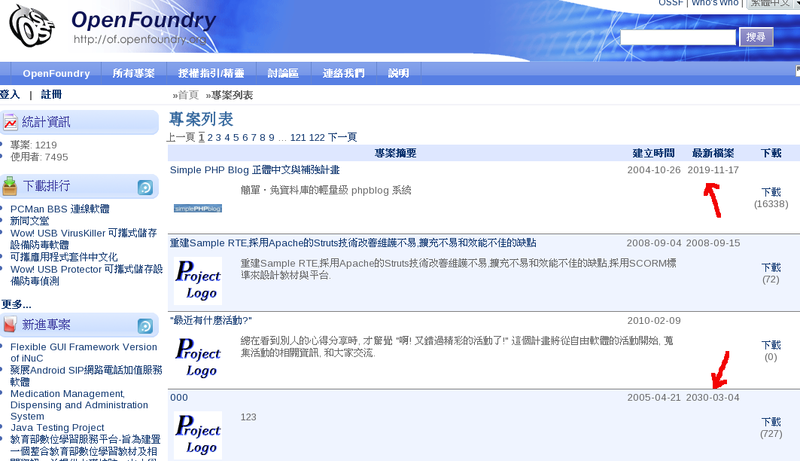 This entry was posted on 下午3:11 and is filed under open source . You can follow any responses to this entry through the RSS 2.0 feed. You can leave a response, or trackback from your own site.